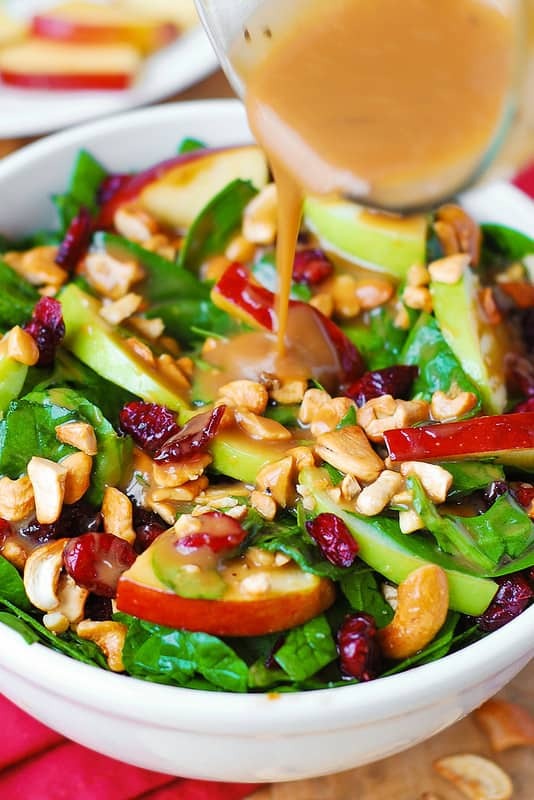 Apple Cranberry Spinach Salad with Cashews and Balsamic Vinaigrette – healthy, delicious, easy-to-make salad! With lots of good for you ingredients, this recipe is packed with fiber, and it’s gluten free! 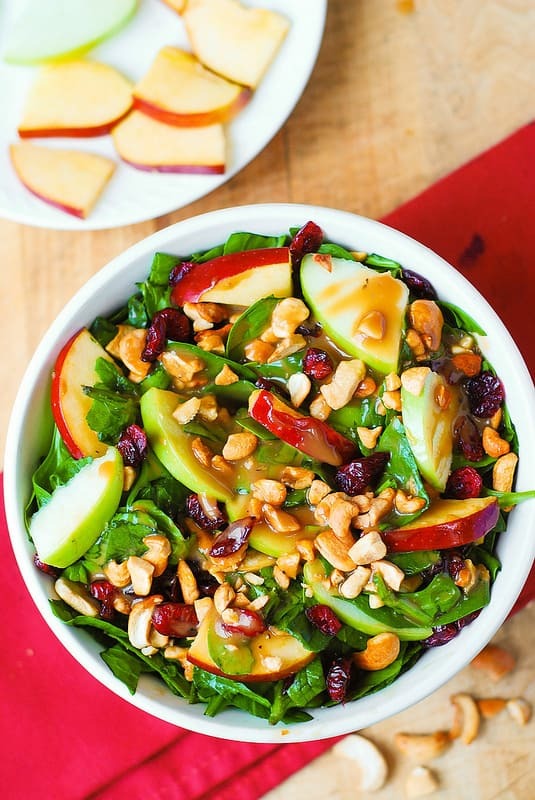 It’s a great salad to make whenever you have spinach and apples, any time of the year. But this salad is definitely a great choice for the holidays, too, especially for Thanksgiving, Christmas, or New Year’s Eve. I love using nuts in fresh salads, and cashews are often my favorite choice, as in this Cranberry Spinach Salad with Cashews and Goat Cheese and Lemon-Honey Poppy Seed Dressing or in this Strawberry Spinach Salad, with Blueberries, Mango, Avocado, and Cashew nuts. Cashews add so much flavor and a nice crunch to any salad. Grind half of cashews into smaller bits, and keep the other half of cashews whole. This adds more texture to the salad and make a pretty presentation. 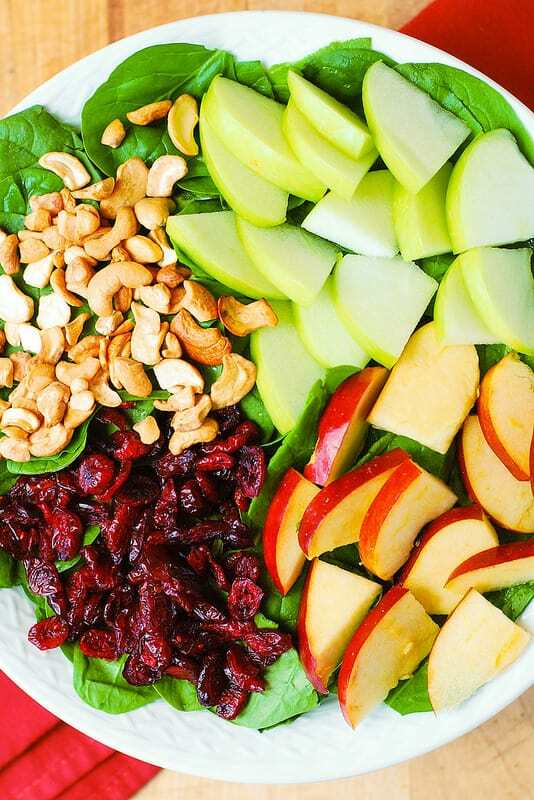 Use 1 green apple and 1 red apple, for color. In this recipe I use 1 sliced Granny Smith apple and 1 sliced Gala apple. Use store-bought or homemade balsamic dressing. 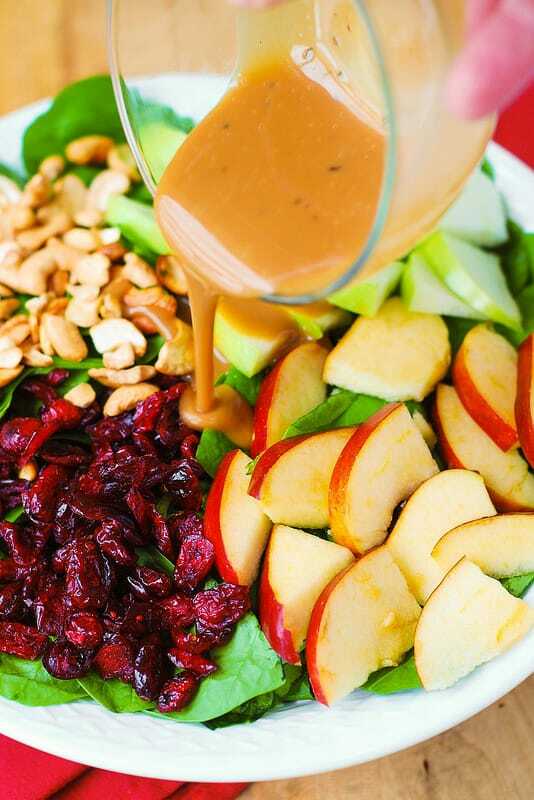 Creamy balsamic dressing will work as well as balsamic vinaigrette dressing. Here is a good recipe for homemade balsamic vinaigrette. Just slice up the apples (one Gala apple and one Granny Smith apple). 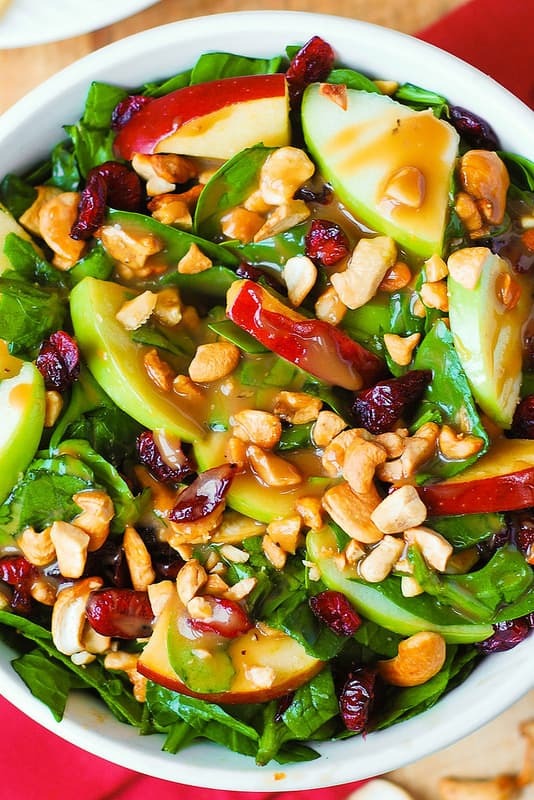 Then combine with other salad ingredients, such as spinach, cashew nuts, and cranberries. Do not add the salad dressing yet. 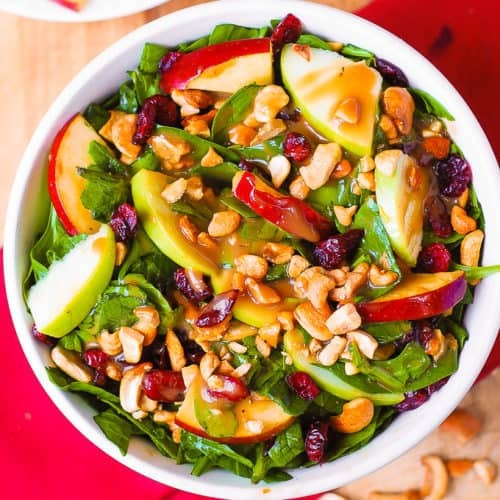 Apple Cranberry Spinach Salad with Cashews and Balsamic Vinaigrette - healthy, delicious, gluten free, easy-to-make salad! Great choice for the holidays, too, especially for Thanksgiving, Christmas, or New Year's Eve. In a large bowl, combine all salad ingredients, except for the salad dressing. Drizzle the salad with the dressing and toss. Serve immediately. Hi Julia, this is the perfect salad for the holidays, everyone loves spinach and this combination of add-ons sounds delicious.